Anytime I know of someone looking for a new pet friend in their lives I find myself advocating and pushing them towards adoption. Although not exactly intended, actress Emmy Rossum has recently joined the ranks of the pet adoption family. While filming on the set of “Shameless” in Chicago, the actress discovered a stray cat that had made home in her trailer. Emmy initially described the stray as “Mean. I mean really mean” and thus fittingly dubbed her new feline acquaintance Fiona G. Kitty after her own character in the hit series “Shameless”. When no one came forth to claim Fiona G. Kitty and she was presumed a stray, Emmy took it upon herself to bring the Fiona G. Kitty to the vet in Chicago. The vet informed the actress that Fiona G. Kitty was dying of cancer, saying although she was a sweet cat, she had cancer, and to let her die. 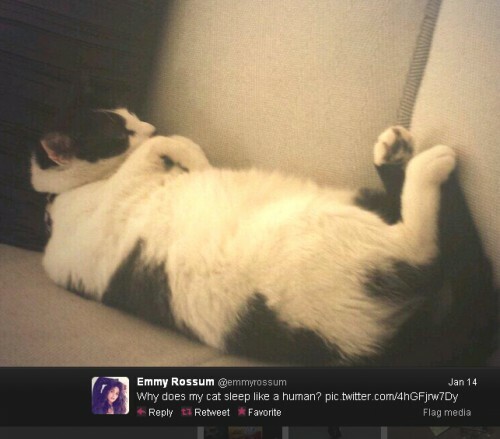 Emmy, not initially a self proclaimed cat lover, but kind at heart thought “No. I can’t do that” and flew the ill fated cancer kitty back home with her to LA to live her numbered days happily. Upon her return home to sunny LA, Emmy brought Fiona G. Kitty to the vet, where to her surprise found out that the so-called cancer that Fiona G. Kitty was diagnosed with, was in fact a hernia; A hernia that could be easily removed when she was neutered. Fiona G.Kitty now has a life expectancy of twenty-five years and although not initially calling herself a cat lady, Emmy is now coming around, happily sharing her LA home with her Yorkie, Cinnamon, and Fiona G. Kitty who are becoming fast friends.